We have another Monday Montage blog hop scheduled for you today. There are ten of us stampers who participate, and all you have to do to follow along is click on the links at the bottom of each post. 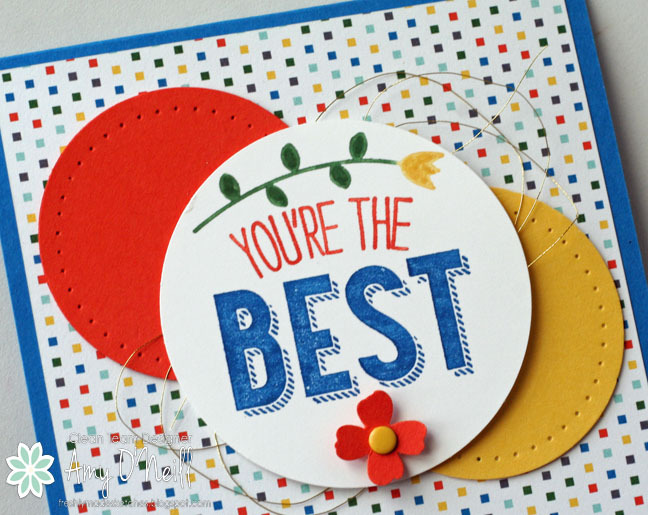 I typed this post up and scheduled it to post tonight before I left for Stampin’ Up’s convention in Salt Lake City. One of the things that I always look forward to at Convention is seeing friends that I only get to see once a year. There were only five of us from this Monday Montage group going to Convention this year, but we were excited to get together for hugs and a little swapping. This is the card I made for these sweet friends. 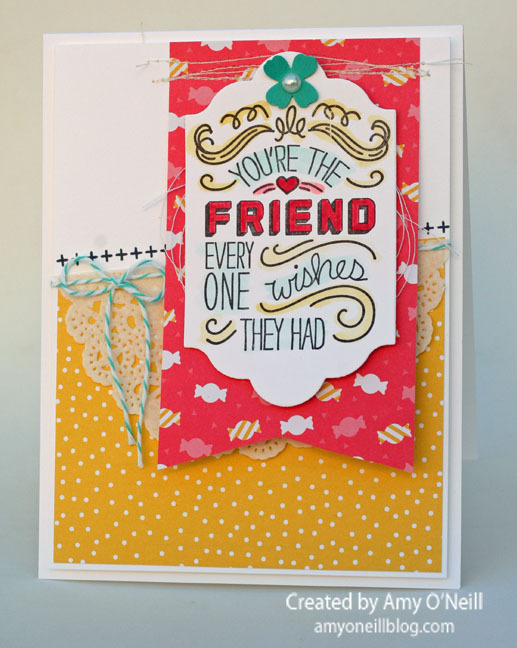 I used the Friendly Wishes stamp set for the fun sentiment. I also used a stamp from Tin of Cards for the little cross border. The paper is from Schoolhouse and Cherry on Top. I even dusted off my sewing machine to sew the banner onto the card. You’re ready to hop on over to Breelin Renwick’s blog to see her beautiful work. If you prefer to work you way backwards, you can hop over to Wendy Weixler’s blog for some creative inspiration. Either way, be sure you work your way through all of the links. We have another fun sketch for you over at Freshly Made Sketches today, and the lovely and talented Kim Singdahlsen has a clean and simple sketch for us. 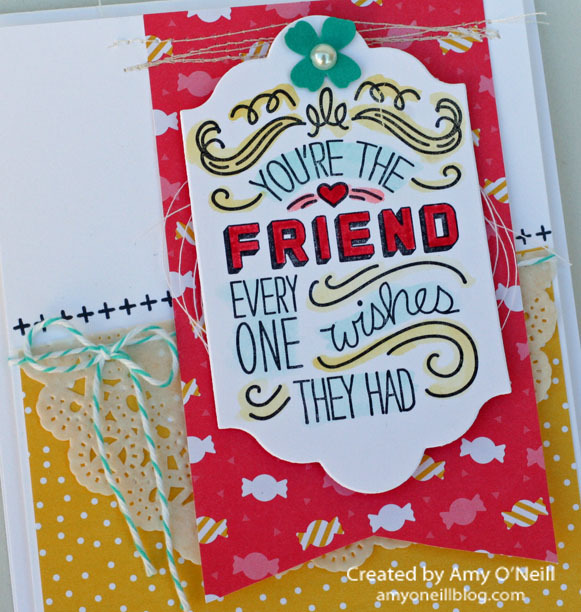 I stayed really true to the sketch this time, and pulled out a new stamp set, Friendly Wishes which I inked up with my Stampin’ Write markers. I love the fun sentiments in this set. I paired the stamp with some of the Schoolhouse dsp. I used Pacific Point on this card. I haven’t used that color in a really long time, and it is such a pretty color. I paired it with Daffodil Delight and Tangerine Tango. These colors came right from the dsp. 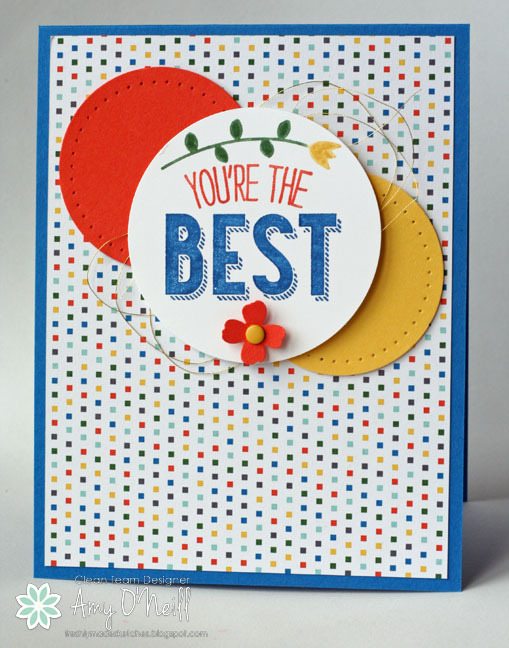 We hope you’ll join us for this challenge and make your own card using the sketch. It’s always fun for us to visit the gallery. Meanwhile, you can hop over to the Freshly Made Sketches site to see what the design team made for a dose of inspiration.